Focusing on the creative and inventive significance of drawing for architecture, the book 'Drawing. 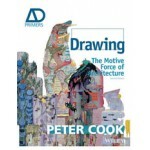 The Motive Force of Architecture' by one of its greatest proponents, Sir Peter Cook, is an established classic. It exudes Cook's delight and catholic appetite for the architectural. Readers are provided with perceptive insights at every turn. 'Drawing. The Motive Force of Architecture' features some of the greatest and most intriguing drawings by architects, ranging from Frank Lloyd Wright, Heath-Robinson, Le Corbusier, and Otto Wagner to Frank Gehry, Zaha Hadid, Coop Himmelb(l)au, Arata Isozaki, Eric Owen Moss, Bernard Tschumi, and Lebbeus Woods; as well as key works by Peter Cook and other members of the original Archigram group. For this second edition, Cook provides a substantial new chapter that charts the speed at which the trajectory of drawing is moving. It reflects the increasing sophistication of available software and also the ways in which 'hand drawing' and the 'digital' are being eclipsed by new hybrids - injecting a new momentum to drawing. These 'crossovers' provide a whole new territory as attempts are made to release drawing from the boundaries of a solitary moment, a single-viewing position, or a single referential language. For this second edition, Cook provides a substantial new chapter that charts the speed at which the trajectory of drawing is moving. It reflects the increasing sophistication of available software and also the ways in which 'hand drawing' and the 'digital' are being eclipsed by new hybrids - injecting a new momentum to drawing. These 'crossovers' provide a whole new territory as attempts are made to release drawing from the boundaries of a solitary moment, a single-viewing position, or a single referential language. Featuring the likes of Toyo Ito, Perry Culper, Izaskun Chinchilla, Kenny Tsui, Ali Rahim, John Berglund, and Lorene Faure, it leads to fascinating insights into the effect that medium has upon intention and definition of an idea or a place. Is a pencil drawing more attuned to a certain architecture than an ink drawing, or is a particular colour evocative of a certain atmosphere? In a world where a Mayer drawing is creatively contributing something different from a Rhino drawing, there is much to demand of future techniques.